There is still no concrete definition for the set of concepts that can define human-computer interaction. In general terms, we could say that human-computer interaction is the discipline that studies the exchange of information via software between human and computers. This is useful for the design, evaluation and implementation of interactive technological devices, studying what can potentially affect. The aim is that, the exchange is more efficient: to minimize errors, to increase customer satisfaction, to reduce frustration and ultimately, do more productive tasks that surround people and computers. Although research in this field is very complicated, the result is very rewarding. It is very important to design systems that are effective, efficient, easy and enjoyable to use as society enjoy these advances. The difficulty is given by a number of restrictions and the fact that sometimes we have to make some sacrifices. The reward would be : the creation of digital libraries where students can find virtual medieval manuscripts of hundreds years ago, the equipment used in the medical field, such as one that allows a team of surgeons to conceptualize, to host and monitor a complex operation neurological, creation of virtual worlds for entertainment and social interaction, service efficient and responsive government – which could range from renewing licenses online through the analysis of a parliamentary witness or smart phones that know where they are and have the ability to understand certain phrases in a language. Designers can create an interaction with virtual worlds by integrating with the physical world. The computer graphics born from the use of CRT and early use of the stylus. That led to the development of pioneering techniques for human-computer interaction. Many of these date back to 1963, the year Ivan Sutherland developed Sketchpad for his doctoral thesis, which marked the beginning of computer graphics. Since that time it has continued to work in this field, creating and improving the algorithms and hardware that display and manipulate objects with much realism, all that, in order to achieve interactive graphics. Some of the related advances were attempts to reach a man-machine symbiosis (Licklider, 1960), increase of human intellect ( Douglas Engelbart , 1963). From these human-computer interaction emerged and became generalized – as in the case of the mouse, bitmapped displays, personal computers, the desktop metaphor and windows and pointers to click. Furthermore, the fact of working with operating systems led to the creation of new techniques to make interfaces input / output, time controls, multiprocessors and to support the fact that they opened several screens or had animations. As human-computer interaction studies the communication between human and machines, this implies that the human-computer interaction will involve both knowledge about : the person and the machine. On the machines it is required to have the knowledge about operating systems, graphical techniques, programming languages ? ?and development environments. About the people, it is important to have some previous knowledge and communication theory, disciplines of graphic and industrial design, linguistics, social sciences, cognitive psychology and human function. In order to have a more approximate to the field of human-computer interaction in which specializes contemplate : Union tasks humans with machines. Human capabilities to use machines (including the ability to understand the interfaces) Algorithms and programs of the interface itself. Engineering concepts arise when designing and building interfaces. The process of specification, design, and implementation of the interface. Sacrifices design. 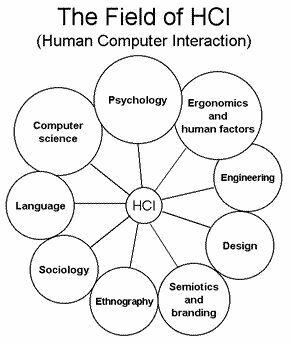 In conclusion, the HCI addresses aspects of the human sciences, as well as engineering and design. Keep in mind that human beings have a limited capacity to process information, which is very important to consider when making the design. We can communicate through four channels of input / output : vision, hearing, touch and movement. The information received is stored in memory, the short term memory and long term memory. Once we receive the information, it is processed through reasoning and acquired skills, such as being able to solve problems or errors. All this process will affect the emotional state of the user, since it directly influences the capacity of a person. Also, a fact that can not be overlooked is that all users have common skills, but there will be others that will vary by individual. The system used can affect the user in different ways. Input devices allow you to enter text, as in the case of the computer keyboard, phone keyboard, speech or a handwritten text, drawings, screen selections with the mouse as example. Output devices we would have different types of screens, mostly those that are bitmaps, large screens for use in public places … In the long term may also count on digital paper. Systems virtual reality and visualization with 3D play an important role in the world of human-computer interaction. Also important devices in contact with the physical world, physical controls such as temperature sensors, movement, etc. Moreover different types of printers would have their own characteristics, sources and characters – like Scanners and Optical recognition system. The last characteristic is the processing. The computer will have a speed limit in processing, on the other hand affect the processing speed to utilizing a network or another. It is important to have a good communication between the user and computer, therefore the interface has to be designed with the needs of the user. It is vital to have good understanding of the two sides since the interaction is not possible without one-sided knowledge. Tagged With human-computer interaction , https://yandex ru/clck/jsredir?from=yandex ru;search;web;;&text=&etext=1834 _0RrKLjXXlgCm1Jh0yas1D_h92DQ6kE50tiSZEK2EYPx9S34uE4ekKamKi2SzAnS 5193182ab134fe6bf5562dcf466c7520785f0e5b&uuid=&state=_BLhILn4SxNIvvL0W45KSic66uCIg23qh8iRG98qeIXme , https://yandex ru/clck/jsredir?from=yandex ru;search;web;;&text=&etext=1834 Wd3ROcj0GO6ZO477RfBQ7JymoneajWN2jjTS8LdMKRB3FH7Zv3e_2X-JATzmEp6D f4b18efccfdc8ce939c808f30c723ed4c4a28a14&uuid=&state=_BLhILn4SxNIvvL0W45KSic66uCIg23qh8iRG98qeIXme , https://yandex ru/clck/jsredir?from=yandex ru;search;web;;&text=&etext=1830 XfBAV55heCE43h9jA6OIHwEx1GtLpMLKUcIqw3zX31IJN3W9bh809cB6d0KyGeo7 bce713f631fe74abd99313be54c025f11b00aaf9&uuid=&state=_BLhILn4SxNIvvL0W45KSic66uCIg23qh8iRG98qeIXme , https://yandex ru/clck/jsredir?from=yandex ru;search;web;;&text=&etext=1829 uf-4CspY4fBr8CEIkO4cbNBF33wghN4gtCv3g0iBeaG6zNJdEnFcAQ7_SEjkTjR_ 6c6d4c213147a39a33e6bb17b3d4d9d641124859&uuid=&state=_BLhILn4SxNIvvL0W45KSic66uCIg23qh8iRG98qeIXme , https://yandex ru/clck/jsredir?from=yandex ru;search;web;;&text=&etext=1829 NXTwhY45I_PTjprd8ahBPA804_iLhiwmfN6jby_p-ePOZ0_HbRTnILFgOr0mdar3 e8cc01d265b821fae012d974f2b8dd32258e12ef&uuid=&state=_BLhILn4SxNIvvL0W45KSic66uCIg23qh8iRG98qeIXme , https://yandex ru/clck/jsredir?from=yandex ru;search;web;;&text=&etext=1828 0yw144dg1xNZzTEULXvTb1FjCmG5R_HUnuuJVG8nF3UKi5i_-8Xi-6EscUBhXMWZ 8b47fe4015be85b6214fbfc555986982d3728c8c&uuid=&state=_BLhILn4SxNIvvL0W45KSic66uCIg23qh8iRG98qeIXme , https://yandex ru/clck/jsredir?from=yandex ru;search;web;;&text=&etext=1827 xNhzeaS9r5J0WAw4VYLlEtKy769jC8gZOVBf_TNmGwwhKjlyDtzXZ5BZxKYtiKo7 1b80bd145e8107c812fb4f9fa7ed1a826cc45739&uuid=&state=_BLhILn4SxNIvvL0W45KSic66uCIg23qh8iRG98qeIXme , https://yandex ru/clck/jsredir?from=yandex ru;search;web;;&text=&etext=1827 mt3H7PXQTjHILfDV2mMKAgQ6wZu53FO0p5VWaTi-tL7zSuUn3sp0NvWnLm38eoHS 39fd03828117c0ecd31c4037df8086c26c83ba61&uuid=&state=_BLhILn4SxNIvvL0W45KSic66uCIg23qh8iRG98qeIXme , Which one of the following is not related with any Human-Computer interaction? Cite this article as: Abhishek Ghosh, "Human computer Interaction," in The Customize Windows, August 10, 2013, April 26, 2019, https://thecustomizewindows.com/2013/08/human-computer-interaction/.